Kevin Conroy, Mark Hamill, Dana Delany, Stacy Keach, Efrem Zimbalist Jr., Hart Bochner, Abe Vigoda. 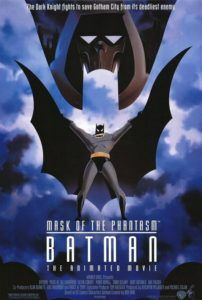 In terms of animated features, Batman: Mask of the Phantasm represents a leap beyond the traditionalized cartoons from companies like Walt Disney by telling an adult story in a medium normally reserved for children. But there’s nothing childlike about the picture, released theatrically in 1993 following the success of Batman: The Animated Series. Warner Bros. 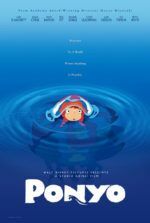 Animation placed its top talent from the early-to-mid 1990s television program on an intended direct-to-video movie, later deemed good enough for theaters. Little could Warner Bros. imagine that it would surpass 1989’s Batman and 1992’s Batman Returns in dramatic scope. Giving an emotion background to Batman’s origin, the story begins with our hero long since established as Gotham City’s dark knight. Bruce Wayne (voice of Kevin Conroy), hardened and seemingly unsentimental, wavers when former lover Andrea Beaumont (voice of Dana Delany) returns after years of absence. Shown in flashback, they shared a loving relationship in a time when he was most vulnerable, before Bruce had discovered his alter-ego, but was certain he must fight back against Gotham’s criminal sprawl. She made him happy, when his life was otherwise consumed by the vow made to his murdered parents: to stop crime and injustice from afflicting others. He tries to choose between his vow and his pursuit of happiness. In one scene, the film’s most affecting, he falls to his knees before the Wayne gravestone, begging his parents to allow him closure. The film’s writers (Alan Burnett, Paul Dini, Michael Reaves, and Martin Pasko) construct a love story, which by the very nature of Batman must end in tragedy. Indeed, at the same time Andrea returns, a number of notable figures in organized crime are murdered by a masked vigilante known as Phantasm. Having abandoned Bruce long ago after their engagement, Andrea left him crushed, his only outlet to become Batman. But she leaves with her father, who went into hiding after being targeted when a deal with mobsters went wrong. Now those mobsters are being slain one by one. And next on the list is the Joker, voiced with maniacal levity by Mark Hamill, who epitomizes the character’s homicidal irrationality with a bright cackle and murderous wit. Bearing grave themes directly linked to Batman’s origins, the film remains rooted in the hero’s very structure—why he does what he does. His motivation is never put aside for a sunnier approach, actionized yarn, or campy entertainment. Instead, the filmmakers have created an animated drama wherein the comic book hero has more tangible emotion than most live-action performers. 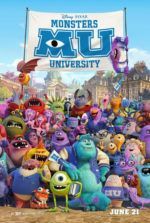 Complex emotions are conveyed in simplistic terms, allowing even young children to grasp the dramatic undertones, while adults feel right at home basking in a superhero story at last handled seriously. 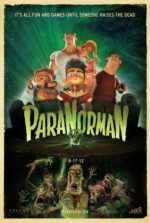 The film is unlike any cartoon you’ve ever seen, at least one primarily advertised to children. Surprising violence marks the story from the first scenes, wherein crime boss Chuckie Sol is murdered by Phantasm—not merely arrested or thrown in jail, but murdered in a car wreck. Another boss is killed when crushed by a gravestone. Joker loses a tooth after getting a Bat-boot in the chops. Whereas earlier cartoons avoid bullets and death to circumvent parents’ angry letters, here cops and mobsters both use bullet-firing guns, versus laser weapons as shown on programs like G.I. JOE. Animators even depict Batman bleeding after a nasty encounter with Gotham’s police, who believe the hero responsible for Phantasm’s murders. It’s all handled with the utmost sincerity, making one see where Tim Burton and Joel Schumacher went so absolutely wrong. The severe tone carries over from the television show, which aired between 1992 and 1995, creating the ultimate Batman narrative tenets in the process. Conceived by Bruce Timm, Batman’s world was never more stylized to suit his dramatic needs. Set in a daringly dark 1940s-looking Gotham City trimmed with Art Deco structures, the cartoon’s environment has a timeless appearance decked out with vintage car designs and period clothing. Cops and crooks alike appear in long film noir coats, guns tucked under every arm, hats tilted down for an ominous shadow. And yet, futurist gizmos are had by Batman and his cavalcade of villains. But more than simply an impressive conceptual achievement, Batman: The Animated Series maintains its legacy by having reinvented the hero’s mythology into stories since repeated in the very comics that inspired it. Created for the show, Joker’s perky, fatalistically-in-love assistant Harley Quinn has become a beloved character of Batman fans, carrying over into comics, and oft-rumored for a live-action film appearance. Furthermore, the show’s revisions of rogues like Mr. Freeze and Clayface resonate with inherent heartbreak, their roles becoming more than just villainesque, but fleshed-out individuals worthy of sympathy. Every episode of the show raised the bar on seventy years of established storylines, amassing a catalog of new principal characterization and stylization for the legend. Batman: Mask of the Phantasm, embodying the show’s complete and focused creative abilities, plays like a dream for those desiring more from their superheroes. When so many comic book stories are reduced to brainless entertainment, this film indulges both adults and children with a maturity that few works of this kind can equal.